Cleveland Browns quarterback Baker Mayfield (6) focuses on leading the offense down the field during the game against the Houston Texans at NRG Stadium in Houston, Texas. 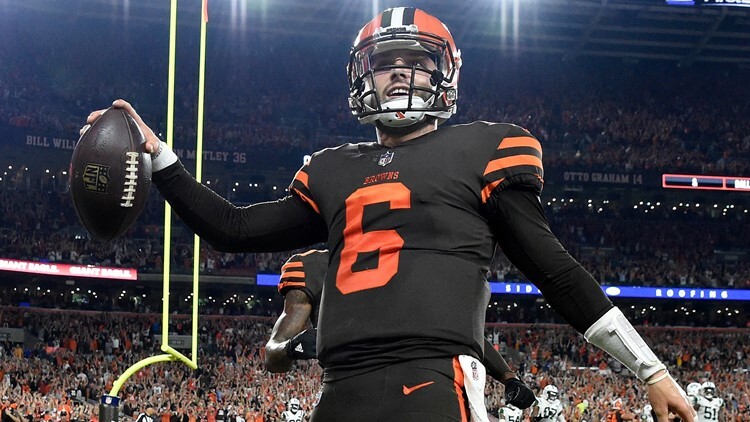 Cleveland Browns fans believe 2019 could be a memorable one, and they are preparing for it by producing movie trailers. CLEVELAND — Many people have heard of the Legend of King Arthur, but do you know the Legend of the Elf? Well, a Cleveland Browns fan aimed to change that by editing together a highlights package from the 2018 season and overlaid the video atop the audio from the trailer for “King Arthur: Legend of the Sword.” The video got more than 3,000 views in less than 48 hours on YouTube. After that line came highlights of wide receiver Odell Beckham Jr., whom the Browns acquired in a blockbuster trade with the New York Giants last week. 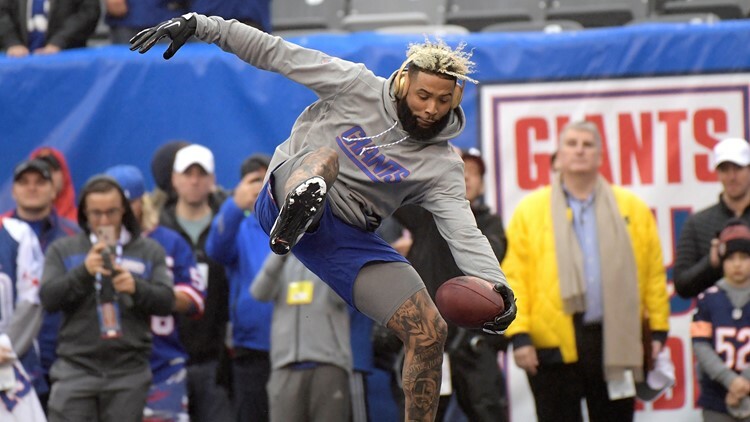 New York Giants wide receiver Odell Beckham works out prior to a game against the Chicago Bears at MetLife Stadium in East Rutherford, New Jersey on Sunday, December 2, 2018. Following the Beckham Jr. clips, the trailer featured highlights from quarterback Baker Mayfield, defensive end Myles Garrett, tackle Larry Ogunjobi, wide receiver Jarvis Landry, tight end David Njoku and cornerback Denzel Ward, all of whom have been acquired since the end of the 2016 season. The “Legend” trailer was one of many created and released by Browns fans in recent days. For the second time in a week, the Browns were featured in a parody trailer for an upcoming “Avengers” movie. This time around, the “Avengers: Endgame” trailer chronicles the struggles of the past and hope for the future. From Bottlegate to Dwayne Rudd’s helmet toss that cost them a season-opening win against the Kansas City Chiefs in 2002, countless blunders against AFC North Division rivalss and a long lineage of quarterbacks, the Browns’ struggles are well documented. 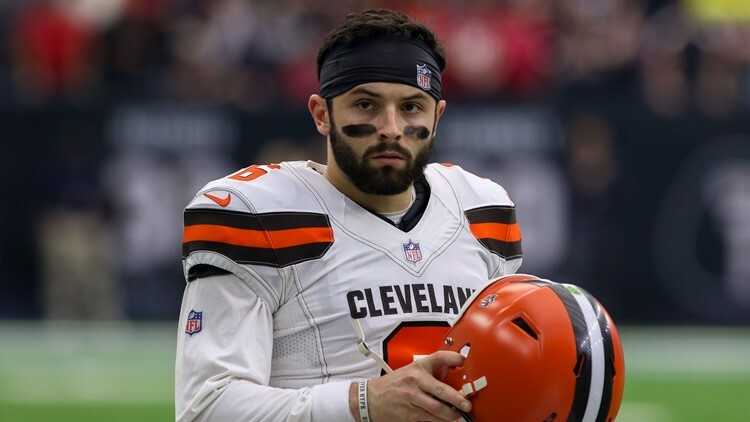 But so was Mayfield’s unlikely rise from heralded rookie to franchise quarterback and the fact that he led a team that was 2-5-1 and in the midst of an unprecedented mid-season coaching upheaval to a 7-8-1 record and kept the Browns in the playoff chase through Week 15. Cleveland Browns quarterback Baker Mayfield celebrates after making a catch on a two-point conversion attempt during the third quarter against the New York Jets at FirstEnergy Stadium in Cleveland, Ohio on September 20, 2018.